How should one choose the best restaurant to eat in? Can one really make money at gambling? Or predict the future? Naive Decision Making presents the mathematical basis for making everyday decisions, which my often be based on very little or uncertain data. 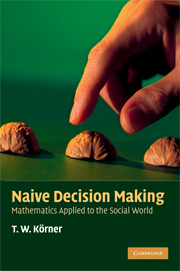 Professor Körner takes the reader on an enjoyable journey through many aspects of mathematical decision making, with relatable observations, anecdotes and quotations. Topics include probability, statistics, Arrow's theorem, Game Theory and Nash equilibrium. 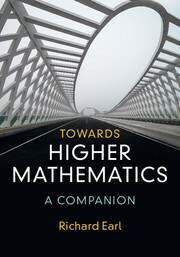 Readers will also gain a great deal of insight into mathematics in general and the role it can play within society. 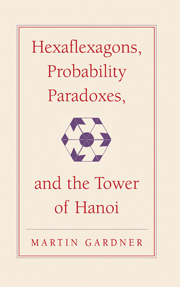 Suitable for those with elementary calculus, this book is ideal as a supplementary text for undergraduate courses in probability, game theory and decision making. 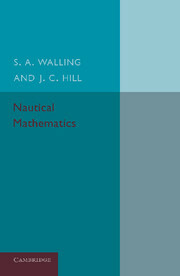 Engaging and intriguing, it will also appeal to all those of a mathematical mind. To aid understanding, many exercises are included, with solutions available online. 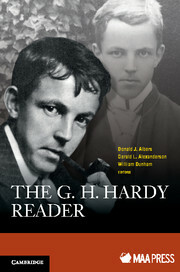 "This is a very well-written and enjoyable book. Körner has a great sense of humor, as evidenced by his selection of anecdotes. Highly recommended." "Naive Decision Making is a book full of pleasure. The writing is crisp, clear, and full of wit. Körner has managed to strike a nice balance between chatty and technical, between formal proofs and illustrative examples, and between breadth and depth of the topics considered. I have already referred a number of my students and colleagues to this book, and I am sure I will refer more in the future. In short, recommending Naive Decision Making is an easy decision to make." 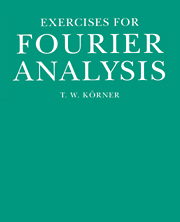 T. W. Körner is Professor of Fourier Analysis in the Department of Pure Mathematics and Mathematical Statistics at the University of Cambridge. He has previously authored four other books including Fourier Analysis and The Pleasures of Counting.